The Korea Superconducting Tokamak Advanced Reactor is a magnetic fusion device being built at the National Fusion Research Institute in Daejon, South Korea. It is intended to study aspects of magnetic fusion energy. 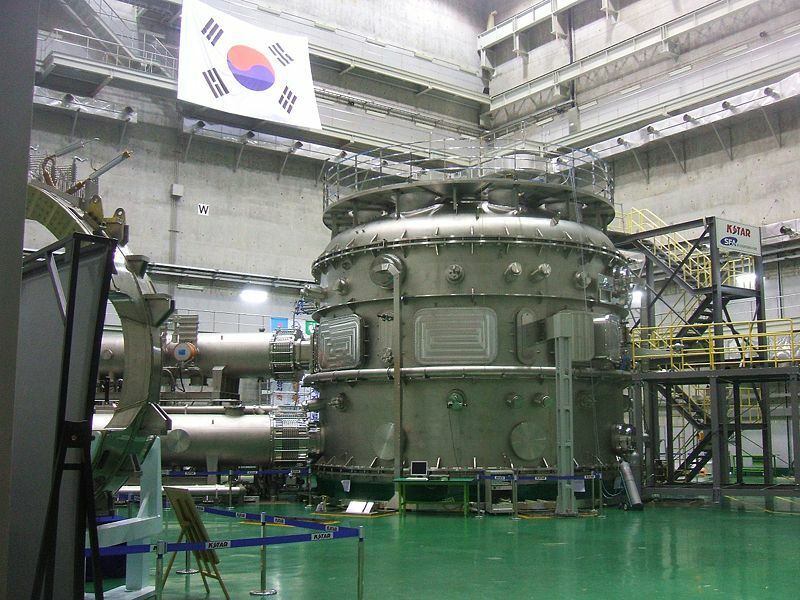 On July 15, 2008, the scientists behind the KSTAR (Korea Superconducting Tokamak Advanced Reactor) project tested the device by created “first plasma“. This is analogous to the first light of a telescope. KSTAR’s task is to test and study various techniques and technologies that will eventually be involved in the commercialization of fusion energy. It is also part of the ITER fusion research project, which has the goal of attempting to usher in an era of environmentally friendly and almost unlimited energy. Although it isn’t at the core of the ITER mission, KSTAR has still achieved several milestones in physics and fusion energy production. It is currently the largest tokamak type reactor in the world, and it is one of the first reactors to use fully superconducting magnets of the same type as those that will be installed in ITER. KSTAR will be studying the use of both hydrogen and deuterium for potential fusion fuel sources, but is not intended to look into the use of tritium, which will be studied by the main ITER reactor once it has been completed. KSTAR requires 30 supercooled (-268°C) superconducting magnets – weighing in at a combined 300 tons – in order to contain the plasma, which can reach temperatures up to one hundred million degrees. No known substance could contain matter at those temperatures, so magnetic fields must employed to keep the plasma from coming into contact with the components of the reactor.